Smelly feet may be at the root of a lot of jokes, but in reality, they are no laughing matter. If your feet smell bad when you take your shoes off, it can be embarrassing. If your shoes themselves smell bad, it can feel even worse. There are dozens of home remedies and products to help with foot odor. But, if the bad smell is coming from shoes, it’s best to start at the source. That’s what insoles for foot odor prevention are a great idea to consider. Odor in your shoes and on your feet typically stems from excessive sweating. That’s why it’s so important to wear the best breathable socks for sweaty feet. Everyone sweats, but some people seem to be more prone to it. Too much sweating through the feet can lead to more significant problems. The smell comes from bacteria that break down the sweat, causing it to decompose. As you might expect, things don’t smell great when they’re decomposing. Removing foot odor starts with fighting the source of excess sweat. Then, it’s a matter of choosing the right treatments. If odors are lingering in your shoes long after you’ve taken them off, it might be a good time to look at some of the best insoles for odor prevention, such as Dr. Scholl's Odor-X Odor Fighting Insoles. 1 What Are the Best Insoles for Odor Prevention? 2 Why Do My Shoes Stink? 3 What Are the Other Causes of Foot Odor? 4 What Are the 5 Best Insoles for Stinky Feet? 6 Are Insoles the Best Product for Bad-Smelling Shoes? 7 What Else Can I Do to Remove Foot Odor Fast? 8 Can Insoles Get Rid of Foot Odor for Good? What Are the Best Insoles for Odor Prevention? This post will focus on five of the top insoles for stopping foot odor from spreading and lingering in your shoes. We’ll also cover what might be causing your shoes to stink in the first place. The best thing you can do is try to treat the source of excess sweat. But in the meantime, a pair of odor-eating insoles will help you to manage the smells that are caused by sweating heavily. That can help to cut down on a lot of embarrassing moments and make your feet more comfortable in your shoes. Keep in mind that all insoles need to be treated and cared for properly. Each brand and each set are different. Some will need to be changed out periodically as they wear out with time. Others can be washed and reused again and again. Consider the type of commitment you’re willing to make with your insoles before deciding on the perfect pair for your individual needs. Why Do My Shoes Stink? The short and simple answer behind ‘shoe stench’ is sweat. Each foot contains 250,000 different sweat glands. That alone is reason enough to understand why they sweat so much, but there is another factor. Most feet are covered all day, unlike other areas of the body. When feet are ‘trapped’ inside shoes with no ventilation, it allows for more sweat to occur. 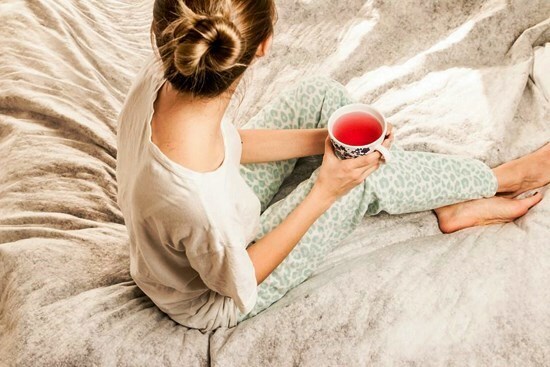 This is the body’s way of trying to cool itself (and your feet) down. Unfortunately, the warm, dark, moist environment of your shoes is a perfect place for bacteria to grow and spread. This particularly bad-smelling bacteria can live on your feet, on your socks, or linger in your shoes for a long time, feeding on the sweat. The more sweat you have, the better the environment for the bacteria. That’s why some people seem to have odorless feet, while others could probably be noticed from a mile away. It all has to do with how much sweat you produce. As technology continues to advance, shoe designs are changing. More and more, you’ll see shoes being created with proper ventilation. However, it may be a long time before every shoe on the market helps to promote proper air flow and circulation. In the meantime, companies have created insoles to help with stinky feet. What Are the Other Causes of Foot Odor? The sooner you get to the bottom of what might be causing foot odor, the easier it can be to remedy it. In many of these instances, lifestyle choices can make a big difference in how bad your feet might smell. What Are the 5 Best Insoles for Stinky Feet? There are several different types of insoles to consider. Keep in mind that the insoles that we’ve reviewed have been designed to solve the issue of smelly shoes. Most of them do this through a variety of different materials and structural design. They can help to reduce the sweat that pools in your shoes. As a result, you should notice less odor coming from your feet, and lingering around in your footwear. Since there are different types of anti-odor insoles, we will focus on a few of the best from different ‘categories.’ That way, you can determine which type of insole directly fits your specific needs. Activated charcoal is one of the most popular ‘ingredients’ in fighting foot odor. Unlike traditional charcoal, activated charcoal is designed to expand and create ‘pockets’ to help absorb moisture and odor. It is the key ingredient in Dr. Scholl's Odor-X Odor Fighting Insoles. These insoles absorb perspiration throughout the day when they are placed inside your shoes. But, the sweat and odor don’t just linger in the materials of the cushioning. The charcoal helps to neutralize odors quickly. So, bad smells continue to get blocked out even when you’re not wearing the shoes. In addition to absorbing moisture and odor, these insoles add a layer of extra comfort to your feet, keeping them protected and dry all day long. No matter what you’re doing, keeping your shoes dry throughout the day is important to avoid things like bacteria or fungal infections. Because the insoles continue to work when you’re not wearing the shoes, you don’t have to worry about stepping into sweaty shoes the next day, either. Dr. Scholl’s has been a trusted brand in foot care for many years. Their Odor-X insoles are no exception and are one of the best on the market as a charcoal shoe deodorizer. Check the Price of Dr. Scholl's Odor-X Odor Fighting Insoles on Amazon! Like charcoal, cedar has also been used as a natural way to block bad foot odor for many years. 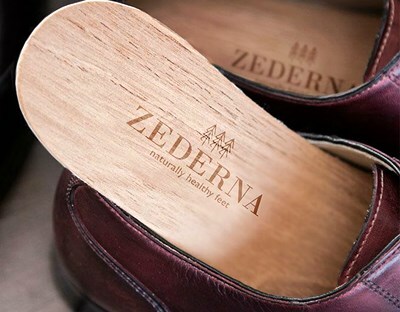 One of the most popular products that utilize this material is Zederna Natural Cedar Wood Insoles. These insoles are made from a mixture of cedarwood and cotton. They are designed to be absorbent insoles for sweaty feet and keep your feet dry even if you’re not wearing socks. Not only are they good for absorbing moisture, but they help to stop bad smells from occurring, too. Cedarwood contains natural essential oils. These oils give off a light and pleasant fragrance of their own, blocking out embarrassing foot odor. One of the best things about using a cedar wood insole is that there is no limit to their absorbing power. You can use them again and again, and they will not lose the ability to soak up as much perspiration as possible. Plus, they are all-natural. Anyone can use them safely without worrying about reactions from synthetic materials or certain chemicals. Cedar insoles are designed to conform to the shape and contour of your feet after just one use, for the perfect fit. If you’re looking for a natural way to combat foot odor, these insoles are a great option and are durable enough to last a long time. Check the Price of Zederna Natural Cedar Wood Insoles on Amazon! 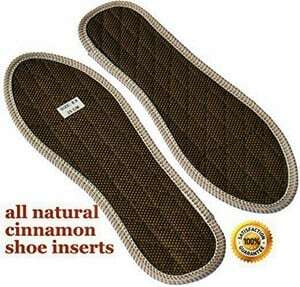 Another all-natural option for foot odor is shoe inserts that feature sweet cinnamon powder. These insoles neutralize bad smells thanks to natural cinnamon oil. When sweat gets absorbed into the material, the cinnamon oil goes to work. Additionally, the cinnamon can be absorbed back into the pores of the feet, which can reduce the smell even more. 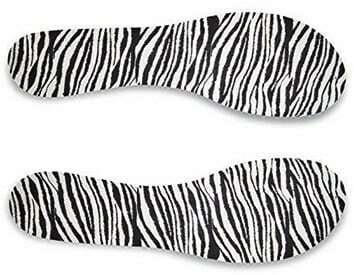 In addition to fighting odor, these are ultra-absorbent insoles. The cinnamon powder will help to target unhealthy foot conditions like fungal infections and other types of bacteria. If your feet have become red or swollen due to uncomfortable shoes or long periods of standing, these insoles also work as an anti-inflammatory solution. Finally, one of the biggest benefits is that they are long-lasting. One pair of insoles will last about three months with regular use. Additionally, if you’re sensitive to chemicals, you can take comfort in knowing these insoles are hand-made. They will provide a protective barrier between your feet and any chemicals that may be lingering on the insides of your shoes. That can lower your risk for skin irritation and other possible foot conditions. Check the Price of Cinnamon Shoe Inserts on Amazon! Using ultra absorbent insoles is one of the best ways to get rid of odors caused by sweat. When it comes to fast-absorbing materials, it doesn’t get much better than these Summer Soles Softness of Suede Stay-Dry Insoles. Made with a soft micro-suede fabric, these insoles quickly absorb moisture like a towel. This creates a safer, healthier environment for your feet while getting rid of bad smells from sweat. Like the name suggests, these ‘Summer Soles’ are discrete enough to be used in things like sandals, pumps, and open-toe shoes. They provide enough support to add comfort but not bulk. One of the biggest problems with many shoes you wear in hotter weather is that sweat can make them uncomfortable and slippery. These insoles help to get rid of that moisture and create a non-slip surface for your feet. If your feet aren’t able to slide around inside your shoes, you’re less likely to develop blisters, calluses, or even bunions. Wearing cooler shoes like sandals in the summer is a great way to combat against excessive sweat in the first place. People who produce a lot of sweat, however, might need some additional help to keep it at bay. These insoles are a great way to fight sweat in hot weather. They even come in a variety of different colors to match whichever pair of shoes needs your attention the most. Check the Price of the Summer Soles Softness of Suede Stay-Dry Insoles on Amazon! One of the biggest causes of sweaty feet that lead to smelly shoes is not wearing socks. Socks can help to absorb some of the moisture from your feet, so it doesn’t end up in your shoes. But, whether you’re wearing loafers, heels, or sandals, some footwear doesn’t allow for sock protection. In these cases, insoles like the Pedag Pure Cotton Terry Barefoot Insole are a great solution. They are made from similar material as a bathroom towel, so they absorb moisture very quickly. The design of these insoles is also meant to allow boosted circulation throughout the shoe. Increased airflow means less moisture and less odor. Finally, these inserts are washable. You should wash them fairly regularly, as you might with a towel. While they do a great job of absorbing moisture, the sweat can tend to stay ‘locked’ inside until they are washed. Always wash in hot water to kill any lingering bacteria. Check the Price of the Pedag 196 Insolve on Amazon! Baking soda – This is great for absorbing moisture in your shoes and on your feet. Do your feet ever smell like ammonia? That likely means the pH level of your sweat is unbalanced. Baking soda not only helps to absorb the sweat but neutralizes the odor by leveling off the pH. Epsom salts – You’ve probably heard of Epsom salt soaks for things like exfoliation, or maybe even to help with aching feet. But, Epsom salts can also help with foot odor. Soaking in these salts helps to detoxify your feet by fighting against bacteria and microbial infections. Tea tree oil – This is a natural astringent. It also contains antibacterial and antifungal properties that can help with any underlying foot conditions. A few drops of this ‘magic’ essential oil can fight back against the bacteria that causes sweat decomposition in the first place. These particular home solutions for getting rid of smelly feet work best when they are used in a foot soak. Are Insoles the Best Product for Bad-Smelling Shoes? If foot odor lingers in your shoes long after you’ve taken them off, insoles are a great solution. Many of them continue to absorb moisture and fight bacteria that causes odor even when you’re not wearing them. They also help to add comfort and stability to your shoes and are easy to change as needed. There are many benefits to keeping a pair of odor-fighting inserts slipped inside your favorite footwear. Of course, there are other products for shoes that are designed to combat bad smells, too. Shoe disinfectant sprays are a popular solution, like the 10-Seconds Deodorant & Disinfectant spray. These sprays are designed to be used in your shoes when you’re not wearing them to not just mask one smell with another, but get rid of bacteria in the process. They are easy to use and can be taken with you just about anywhere. Use a quality shoe spray every night and your shoes won’t have such a noticeably strong odor the next day. Everyone may have a different preference as to which product is most effective for them. Choosing the right product for your shoes should combine convenience and ease of use with how well the solution gets rid of bad smells. Insoles are a great option because they do provide that convenience factor. But, if you’re ready for something different, give one of these suggestions a try. What Else Can I Do to Remove Foot Odor Fast? Clip your toenails – One potential cause of bad-smelling feet is toenail fungus. It can cause a cheese-like smell to come from your toes. Clipping your toenails relatively short makes it harder for a fungal infection to grow and spread. It also makes cleaning your nails and getting underneath them much easier. Better hygiene – This may seem obvious, but practicing proper hygiene is a great way to prevent bad odors from building up on your feet. Clipping your nails is only one part of this. You should develop a daily hygiene routine specifically for your feet like you would with any other area of the body. Far too often, feet get ignored when it comes to cleaning them properly. Making sure they are washed and fully dry each day can help to ward off odor-causing bacteria. Change your shoes every day – If an odor is lingering in your shoes (even with insoles), try switching them out each day. If you wear the same pair of shoes two days in a row, you may not be giving them a chance to air out. If moisture lingers in the shoe and gets trapped, it can add to the bad smells already in the material. Alternate shoes as much as possible to give foul odors a chance to dissipate. Change your diet – Sometimes, foot odor can be a result of what you’re putting in your body. If you have a diet rich in carbohydrates, you could be providing excess fuel and food to fungus and bacteria. Limit your carb intake and replace it with lean protein and healthy fats, as well as fruits and vegetables. Try limiting your alcohol intake as well. Most people don’t think about the high amount of carbohydrates found in alcohol, but they can be a large contributing factor to bad-smelling feet. Quit smoking – Most people know that smoking comes with a lot of potential health risks. But, did you know it can make your feet sweat more? The nicotine found in cigarettes increases your heart rate. To compensate, your body tends to sweat more so it can cool down. As you might expect, that means your feet sweat more, too. The more sweat, the more likely it is to have foot odor. If you needed another reason to quit smoking, this is it. Can Insoles Get Rid of Foot Odor for Good? Choosing one of the insoles listed above, such as Dr. Scholl's Odor-X Odor Fighting Insoles, can help to remove odor from your shoes. Many of them contain properties that will also help to fight against the bacteria that cause bad smells, to begin with. So, can they help with smelly shoes? Absolutely. However, these insoles will work best when they are combined with preventative measures for getting rid of stinky feet. Try to determine why your feet might be giving off a bad smell in the first place. Whether it’s sweat, stress, or something else, it may be able to be remedied or at least reduced. Following some of the additional tips listed above can get you started on the right path toward better-smelling feet. If you take the right steps to stop your feet from smelling, the insoles will do their job to get lingering odors out of your shoes. This ‘double method’ of preventing smelly feet is the best way to get rid of foot odor for good.